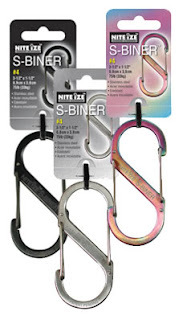 The S-Biner is a double gated thin carabiner from Nite-Ize, the biner is available in 3 sizes. Size 2 "small" is 2 x 7/8 inches and can load up to 10lb (4.5k). Size 3 is 2 5/8 x 1 1/8 inches and can load up to 25lb (11k). Size 4 is 3 1/2 x 1 1/2 inches and can load up to 75lb (33k). The gates operate smoothly enough to be easy to open and close but have enough strength to prevent being opened by accident. The double gate is useful in several ways, you can use one gate for your keychain items and the other as an attachment point or you can use the s-biner to connect items together. The biggest problem we had with the s-biners is that even the smallest one is a little bulky for what we like in a keychain or to hang from a belt loop, they are quite noticeable. A smaller version would probably be better for a keychain, since the sizes offered are 2, 3 and 4 maybe there is a size 1 planned for a near future. If the sizes are good to you the product is nice, works as expected and seems to be solid enough to live up to the specifications. Remember this is not a climbing product, just an accesory. You can read more in Nite-Ize's website and you can get them from $2.99 in black, silver or spectrum colors from ZBattery.